The latest version of donnatella can be downloaded here. For Arch Linux users, the AUR has a PKGBUILD. You can find the source code on this GitHub, where you can also report bugs, send suggestions or other (constructive) feedback. 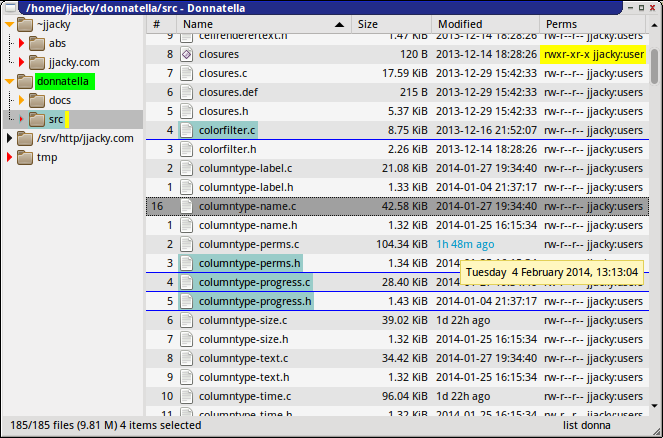 donnatella - donna for short - is a free software, GUI file manager for GNU/Linux systems. Registers. vim users are familiar with the notion of having more than one "internal clipboard" (or register). donna uses a similar concept, and you can cut/copy files to any register you want, have as many as you need, and the clipboard is simply a special register (named '+'). In addition to the regular cut/copy/paste operations, donna offers a little more: you can also add to a register, you can paste forcing the operation to be a copy or move, regardless of how items where put in the register (i.e. whether they were cut or copied), you can also paste into a new folder (to be created on the fly) or even delete the content of the register. Key modes. Unlike most (GUI) file managers, donna works with a system of key modes, inspired by what can be found in vim. This means that every key can be used to trigger an action. For instance, pressing yy will yank/copy the focused row to the default register, and "+a2j will add to the register '+' (i.e. clipboard) the focused row and the 2 below it. Then you can e.g. paste the clipboard into a new folder, using "+N You'll be prompted for the name of the new folder, with a few defaults taken from the first files to be pasted. Of course not everything is register-related, you can also edit the name (i.e. rename) via en, set the second sort order by size descending via #dSs and much more! Best of all is that you can define every key to your liking. Marks. There are lots of great ideas in vim, and marks are (also) one of those. Very much like you'd do in vim, pressing md will set mark 'd' to the current location. When you need to jump back there, simply press 'd You can also use 'M' to set the mark to the focused row, to find that file again without needing to scroll and look for it. And in addition to such standard mark, donna also supports dynamic marks, where the destination isn't a location to jump to, but a command that will give said location. For example, '' will jump back to the previous location in history (i.e. Go Back). Click modes. Because using the mouse can be pretty useful too, just like you can define your keys, you can define your clicks. Don't like that middle click on blank space scrolls to the focused row, you'd rather go up, or back? It's all possible: just tell donna what to do, and it'll do it. Commands. As you've probably guessed by now, in donna, about everything that can be done is done by commands, and you can assign commands to about anything. Scripting. Because if donna does not come with its own script engine/parser - why would it? - instead, it uses commands, including command exec which allows not only to execute something, but have its output be processed as return value of said command. But to make things even easier, donna creates a socket on start, which can be used to trigger commands from anything that use sockets. And to make writing simple scripts (e.g. bash), an helper donna-trigger is provided. Mini Tree. As it happens, sometimes less is more. Browsing around in your file system might be something you do every single day, but you rarely visit every possible location every day. In fact, you probably have a limited set of locations you really need/use at a time, so why have to deal with a tree filled with all the useless noise? The minitree will only show locations you actually visited, hiding siblings until you actually go there, or ask to show them. Expanders will be red when no children is loaded in tree, orange when only some are (known as partially expanded), and black when all children are loaded (This, amongst other things, can be customized via CSS). A middle click will let you switch, and a right click will popup all the children to let you easily browse where you need to go. Multi Root Tree. Sure, by default your tree will have one root, that of your file system. But that's not always the most useful. 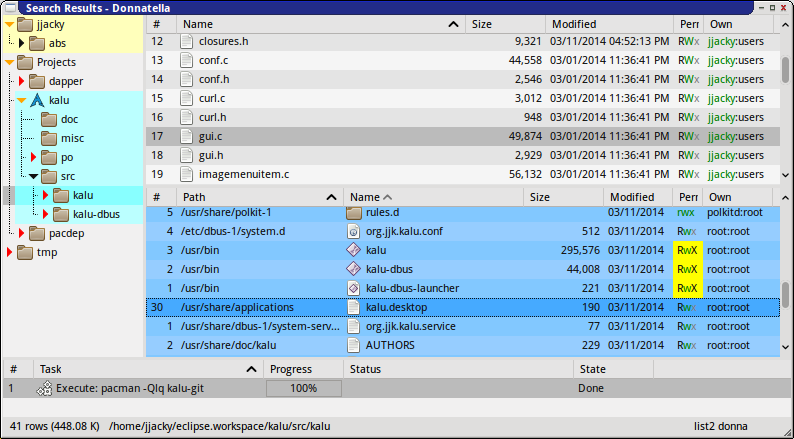 Maybe you'd like to have your home folder as a root, or event just your project's main folder? You can do it! donna let's you use the location of your choice as root, and you can have as many roots as you need. Another great addition to the minitree to reduce the noise and focus on only what you need. Multiple Trees. So you can find your tree exactly as you left it, you can save it to a file, and load it later. Of course, you can also do the same for lists. Selection Highlight. This might be a personal one, but I can't stand the "full row select" thing, which seems almost the only thing know in the world of Linux. So donna let's you decide how to highlight selected rows: full row highlight, column (cell) highlight, full row underline, or (personal favorite) a combination of column (cell) highlight & row underline. Of course this is a treeview option, so your tree & list can use different ones (e.g. no underline on tree). Full Layout Control. Single pane? Dual pane? Octopane? However you want things is how you'll get them. (Custom) Context Menus. Contextual menus in donna aren't hard-coded, but user-defined. Of course it comes with sensible defaults, but it is easy to tweak them as you wish, adding, moving, or removing items and/or submenus. And since you control the keys & clicks, you can decide when to show which menus, e.g. making yourself custom context menus as you want. Control you columns. You can specify which columns to use and in what order of course, but also the format of each of them. However you want you date or size to be formatted is how they shall be. donna can even show the age of files (e.g. "42m ago") instead of a full date, for all files or only recently modified ones, or use a customizable "fluid" format. donna also offers a colored ways of showing permissions, focusing on what you can do (and why). And of course, tooltips can be used for the more lengthy format. Arrangements. An arrangement is what donna will use to show a location on list. Every time the list changes current location, a new arrangement might be loaded (if needed) and used. It will define the columns to use, sort orders, color filters & can even include column options. Column options do not indeed come from a single location in config, instead multiple locations are tried, referred to as the option path. Using such option path allows you to use arrangement to have different columns, or column options, based on the current location. You can therefore have certain locations with a different default sort order, a different format to show time or size, specific color filters used instead - or or in addition - to general ones, even a different set of columns. Filters can be given a name, icon and/or alias, and because they are nodes, they can easily be used in menus like any other nodes. Visual Filters. Speaking of which, visual filters allow you to only show on list the files you're interested in. As seen, you can use any and all criteria you wish, and since VF don't go away on location changes, this might even serve as a quick way to find files. And since files are often what you might be looking for, you can also have VFs only apply to items (files), not containers (folders). Custom Properties. Of course nodes come with their properties (e.g. name, size, etc) but sometimes you want some extra (meta-)data, and this can be achieved in donna via custom properties: You define the domain it applies to, optionally a filter (e.g. to only be added to pictures, files/folders in a given location, etc) and the command line to execute. Then, when the property is accessed/refreshed, donna will execute said command line, with the property name & file name(s), parsing the output for the values. You can then simply add columns to show those new properties, and see duration of video files, dimensions of pictures, uncompressed size of compressed archives, and just about anything you can think of... It's up to you, be creative! For performances issue, donna will try to execute the command line for groups of nodes at once, but you can also have columns not show anything by default, and instead of "preloading"/refreshing properties as soon as possible, wait for nodes to become visible to do so. Or, you can use on-demand feature, and properties will only be refreshed via a command or when clicking on the column's refresh button. Colors. Using colors can help a lot to figure out things without having to actually read and analyse information. Certain rows on tree can be "boxed" to have a specific background color (that extends to its children), to easily spot where you are. You can also use an highlight effect in the row itself only. And of course color filters can be used on list, based on any criteria, and applying color to the entire row of the column of your choice (thus allowing to "combine" filters). Tree Visuals. In addition to the box & highlight effect, you can also specify a name and/or icon to use for a specific row. The former can be especially useful for your own roots. You can even specify a row-specific click mode, pretty useful when using a tree to store bookmarks/favorites. Lots of attention is being put into donna and such "details." Search Results. As explained earlier, donna doesn't search, but parses the output of find and presents the results in its GUI. In fact, it can parse the output of anything outputting a list of full file names, so you can use which ever tool you need for the job required. Simply use prefix < to indicate that the output should be parsed; E.g: exec:<pacman -Qlq foobar will list all the files owned by package foobar (on Arch Linux). This allows you to simply interact with donna & its configuration in a very simple/natural way, for example changing an option's value as you would rename a file, or going to "register:t" to browse the content of register 't', and simply select & remove files from there as you would from any regular folder. Embedded Terminals. Because as useful as a GUI file manager can be, sometimes there's no question: a terminal is the best/only/easiest/fastest way to get what you need done. This also means you can you the power of any CLI tool from donna, e.g. use less to view files, vim to edit them, or git to show the log, a diff or whatever you need. For example, using donna's aliases you could press : and then get the diff of the last commit by typing g d last -p (assuming "g" is an alias in donna for "exec:!git" (i.e. run "git" in embedded terminal) and "last" a git alias to "log -1 HEAD"). Much More. There's even more goodies in donna already, and an even longer list of things to add. donna is still early in development, and many things aren't done yet. It comes with HTML documentation; Even though it's not quite complete, the main features & all commands should be documented. If you have ideas, questions or comments feel free to either open an issue on github or email me. And if you encounter any bugs, please let me know so I get a chance to try and fix them. Please note that the 0.x versions belong to the development branch, i.e. this is an early release, and while the application is functional, there is lots that hasn't been implemented yet, things will change, and bugs will be found (and dealt with). So it's probably not a good idea to use it "in production," but feel free to give it a try, and report what you thought. donna is built upon GTK+3 (and the underlying GLib/GIO libraries). However, because some of the features of donna were not doable using GTK+ as it is, especially when it comes to the treeview, a patchset is available. This set of patches for GTK+ (3.18.4) will fix some bugs & add extra features, all the while remaining 100% compatible with GTK+3. You can safely compile your patched GTK+ and install it, replacing the vanilla GTK+. It won't change anything for other applications (unless they were victims of the few fixed bugs), but will unleash the full power of donnatella. For Arch Linux users, the AUR has a PKGBUILD. Obviously it would be better if this wasn't necessary, and I'd like to see all patches merged upstream. This is a work in process, but unfortunately upstream doesn't seem too eager to review those patches (Seems they don't have much love for the treeview, because client-side decorations are so much more useful... :p). donnatella is free software: you can redistribute it and/or modify it under the terms of the GNU General Public License as published by the Free Software Foundation, either version 3 of the License, or (at your option) any later version. donnatella is distributed in the hope that it will be useful, but WITHOUT ANY WARRANTY; without even the implied warranty of MERCHANTABILITY or FITNESS FOR A PARTICULAR PURPOSE. See the GNU General Public License for more details. Standard layout: tree on the left, list on the right. Multiple roots on the tree, with some custom names and highlight effect on two folders: "donnatella" in lime, and "src" (current location) in yellow. A selection on the list, and the tooltip for the date of an item (recently modified, hence the age showing in column). A couple of color filters in effect, on recently modified file and wordly executable one. In configuration: Browsing the configuration using a standard layout. Another layout: This time the tree is on top and the list on bottom. Both are using full row select highlight, with different formats again for size & permissions. 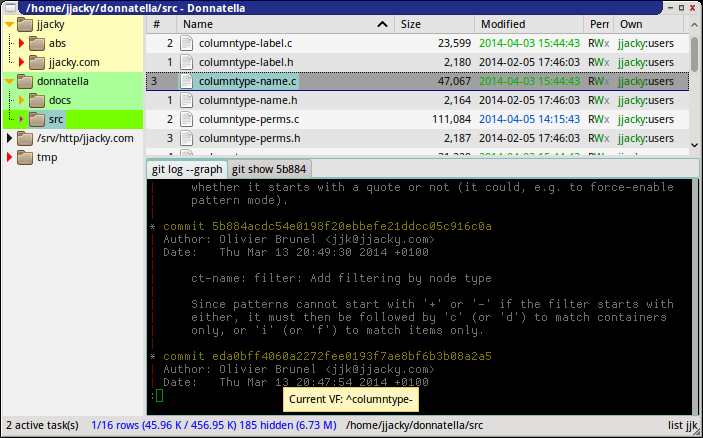 The list with a Visual Filter applied (as indicated by the blue color on the status bar, or its visible tooltip showing the current VF); and an embedded terminal running a couple of git processes (using urxvt). An example of custom properties in action: in the top list, folders of PKGBUILDs I maintain, with a column for the pkgver and one for the last commit message on each folder, as commonly seen in github and other similar interfaces (since my PKGBUILDs are, of course, in a git repo). The bottom list has some video files, with columns for duration & codecs as well as a column for the MD5 hash of files, all available on-demand (click needed to refresh/load the properties). An example of the fluid time format, alongside some time-based color filters. Also a column for custom properties to show uncompressed size of XZ archives. You can check out the following blog posts, or head over this topic on Arch Forums.